1. Bach & Friends: San Francisco Classical Voice hosted the west coast premiere of a new documentary about the great Baroque composer produced and directed by Michael Lawrence at the Sundance Kabuki cinema. The often compelling film features interviews with such leading lights from various musical genres as Joshua Bell, Hilary Hahn, Bela Fleck, Bobby McFerrin, Chris Theil and the Emerson Quartet. The film is dotted with lively scenes and beautiful performances. Among my favorites are an hilarious spiel by Peter Schickele about his fictitious musical creation, P D Q Bach, a scene in which an improviser has his neurological patterns monitored by improvising Bach-like keyboard music in a brain scanner and a section in which a 12-year-old pianist talks about the experience of playing Bach in an elderly people's home. But the film is about half an hour too long and the cinematography, which revolves around endless close-ups, gets predictable after a while and looks ugly. (Do we really need to have our attention forced on the pores in Simone Dinnerstein's skin and Joshua Bell's double chin for 10 minutes? It distracts us from the music.) 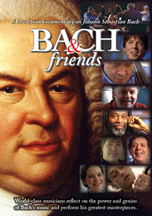 Another heresy is that the documentary includes exhaustive performances of Bach's works for keyboard, string quartet and solo strings, but doesn't even mention any of his choral music. No St Matthew Passion. Not a single cantata. This is a massive oversight. Nevertheless, Bach & Friends provides a touching, refreshing and generally engaging view on the impact of the great composer on our lives today. 2. Silent Film Festival pre-opening reception: Turned up for the tail-end of a reception for this weekend's Silent Film Festival (at which I will be moderating a panel on silent film composition and performance this Saturday.) The highlight was watching the composer Matti Bye and three members of his ensemble squish together on the bench of a Steinway Grand and improvise an eerie silent film-like score. 3. Bardot A Go Go at The Rickshaw Stop: Spent the rest of the night shaking some tush at the Rickshaw's Bastille Day homage to 1960s French pop. The Rickshaw is one of my favorite clubs in town because of the diversity and inventiveness of its programming which ranges from bhangra dance classes to a cappella choral concerts. The crowd was dressed appropriately in svelt little mini-dresses and Jean Paul Belmondo skinny tie cool. The music and video projections were suitably gamine -- lots of film footage of France Galle bopping about in her symmetrical blonde bob. My only criticism of the event was the infiltration of tracks with English lyrics on the playlist. On Bastille Day, only French language tracks should be allowed. Vive la France.